Most businessess need a way to easily add and update content, images or video. Keeping your site fresh with up to date info, sales and new arrivals will draw repeat visitors. When you supplement content with advertising, search and a variety of social media you will create a strong web prescence and your business will grow. However, you are not a coder and do not want to hire someone due to either cost or the fact that they do not know your business as well as you. A content management system is the answer. There are a variety of platforms: Word Press is the most popular CMS with Drupal and Joomala following. Then there are more visual based systems like WIX. While these "canned" platforms are good for some they come with several caveats. First, these platforms are huge and while providing a ton of functionality are extremely complicated. Just check out this screenshot. All those links down the left side have multiple links underneath and then most pages have several options. The other systems are not much better. You see, these are built to be all encompassing and do everything - thus the complexity. Most small businessess do not need this array of services. Second, many systems extend their functionality by allowing 3rd party developers to create software called "plugins", these allow you to do very specific things and can be beneficial. However, you will always have to monitor and update these to the current version, and while easy this just takes more of your valuable time. Third, these are "open source" systems. Which means 100's of developers are involved. There is no central control or plan thus the poor navigation scheme. But there is a more serious problem. These systems are highly vulnerable to hacking attacks, why take the chance? Fourth, there is absolutely no help. Sure there are online tutorials (we have those as well) and various resources but no personal, talk to a live human if you ever need support. Most importantly these systems may not do exactly what you want. Did you need to add a certain item, want the online catalog to have this feature? Sorry, you can't. While offering great functionality the systems can not be changed and everyone in the world gets the exact same thing. Does that sound like a good fit? So what is a business owner to do? Tier has built a very large code base from which your system is derived. But you are not getting a template site, the code base allows us to quickly assemble all the "plumbing" every CMS needs so we can concentrate on building the interface and functionality that you require. Additionally, the code base greatly reduces the time it takes to create (usually 2-3 weeks) and we pass these savings to our clients. You get both flexibility and affordability. Moreover, we are constantly upgrading and adding new features as well as being available if you experience any problems. So take the next step, call us to discuss your CMS system. Tier offers a free no pressure consultation where together we discuss your business situtation. We will provide a ball park cost and time estimate then get started when you are ready. 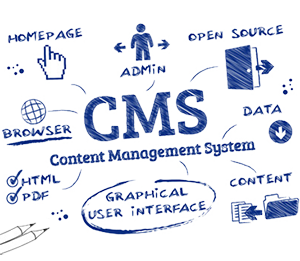 Let us build a great CMS for your business.